Aqua Flo XP2 3HP 230V 2-Speed 48 Frame Gecko XP2 replacement hot tub pump. This is the original brand Gecko/AquaFlo spa pump. Aqua-Flo XP2 hot tub pump, 48 frame, R0, 3.0 OP.HP / 4.0HP, 230V, 60HZ, 2 speed 2'' inlet & discharge, compression fittings included, no cord. This is the original Aqua Flo spa pump, not just the wet end coupled with a no-name motor like some other outfits do. 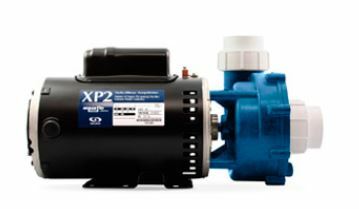 Aqua-Flo pump XP2 has been quality built and engineered to provide maximum efficiency under normal water pumping conditions. Never run the pump dry - the spa should be full of water with the plumbing filled as well and with all suction and discharge lines clear and unobstructed with any service valves in the full open position.